On a clear day, the towering white peaks of the legendary Popocatepetl and Iztaccihuatl volcanoes can be seen from the great metropolis of Mexico City. Rising beyond 17,000 feet in elevation, these two majestic mountains offer the viewer a breathtaking sight. Snowcapped year round, the well-known landmarks have captured people's imaginations throughout the ages. Located just 45 miles southeast of the nation's capital, Popo and Izta, as many affectionately call these two volcanoes, share a story that reaches back into the mists of time. Geographically, these two glacier-iced volcanoes represent the second and third highest mountains in Mexico. The name Iztaccihuatl in the indigenous Nahuatl language means "White Woman" and the mountain actually includes four peaks, the tallest of which reaches 17,158 feet. Many see her silhouette as resembling that of a sleeping woman, complete with head, chest, knees and feet. Iztaccihuatl is an extinct volcano and is a popular destination for adventurous mountaineers and hikers. Popocatepetl is the taller of the two mountains, reaching an incredible 17,802 feet in height. Popocatepetl and Iztaccihuatl are connected by a high mountain pass known as the Paso de Cortes. Popocatepetl is still active with the volcano having spewed smoke and ash as recently as 2001. In the Nauhuatl language Popocatepetl means "Smoking Mountain" and as we shall soon see, was aptly named. In Aztec mythology, the volcanoes were once humans who were deeply in love. This legend features two star-crossed lovers, the young brave warrior Popocatepetl and the beautiful princess Iztaccihuatl. The father of Iztaccihuatl, a mighty ruler, placed a demanding condition upon Popocatepetl before he could take Iztaccihuatl as his bride. His mandate required that Popocatepetl first engage in battle against the tribe's enemy and return victorious. Variations of the legend include the added stipulation that Popocatepetl needed to return with the vanquished enemy's head as proof of his success. The story continues with Popocatepetl setting off for battle with Iztaccihuatl waiting for her beloved's return. Treacherously, a rival of Popocatepetl's sends a false message back to the ruler that the warrior has been slain when in fact, Popocatepetl has won the battle and is ready to return to his Iztaccihuatl. However, the princess upon hearing the false news, falls ill and succumbs to her deep sorrow, dying of a broken heart. When Popocatepetl returns triumphant to his people only to encounter his beloved's death, his heartbreak is inconsolable. 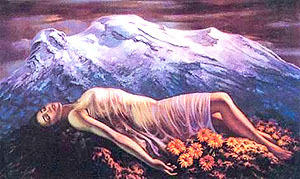 He carries Iztaccihuatl's body to the mountains whereupon he has a funeral pyre built for both himself and his princess. Grief-stricken beyond measure, Popocatepetl dies next to his beloved. The Gods, touched by the lover's plight, turn the humans into mountains, so that they may finally be together. 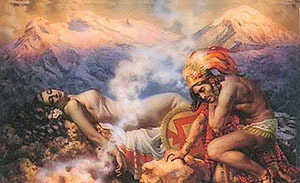 They remain so to this day with Popocatepetl residing over his princess Iztaccihuatl, while she lay asleep. On occasion, Popo will spew ash, reminding those watching that he is always in attendance, that he will never leave the side of his beloved Izta.